Rosey is a native of San Antonio with an MA in School Counseling from The University of Texas at San Antonio. For over 14 years, her counseling background has allowed her to genuinely help and serve the San Antonio community. 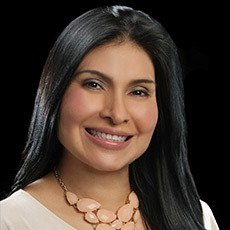 Prior to discovering her passion in real estate, Rosey was as a high school teacher, coach and counselor in various school districts which include, Northside, San Antonio and Harlandale. Rosey fell in love with real estate when realizing she possessed all the people skills needed to guide and counsel families through positive and negative events in their lives. Rosey is well- acquainted with the pillars of customer service, work ethic and integrity. Rosey is committed to exceeding her clients buying and selling needs. She is fluent in Spanish and honored to earn your business. Rosey understands the transaction process can be overwhelming and stressful. Her greatest satisfaction comes from making sure her clients are pressure free, from contract to close. Rosey’s free time is spent with her husband, Fred and their newborn son, Andrew. She explores and appreciates other cultures through traveling. Rosey finds relaxation in cooking new dishes and regains peace of mind through jogging and hiking.